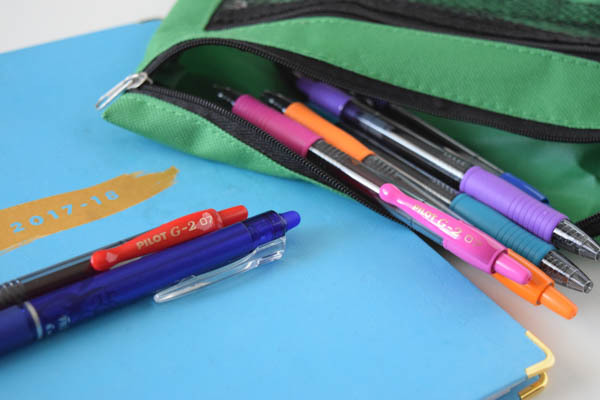 This time of year with Back to School out in full swing, I find myself getting excited as I walk down the aisles of paper, planners, crayons, and my favorite school supply-pens! And when it comes to my planner, I have to have it looking cute and full of life. But it needs to be organized too. Click the image above to see my favorite Pilot G2 Pens! My favorite pens to use when dolling up my planner AND getting it organized are the Pilot G2 pens. I’ve been using them for years when I found them for scrapbooking. As the #1 Selling Pen Brand in America, Pilot has something for everyone – including four point sizes and 20 vibrant colors. 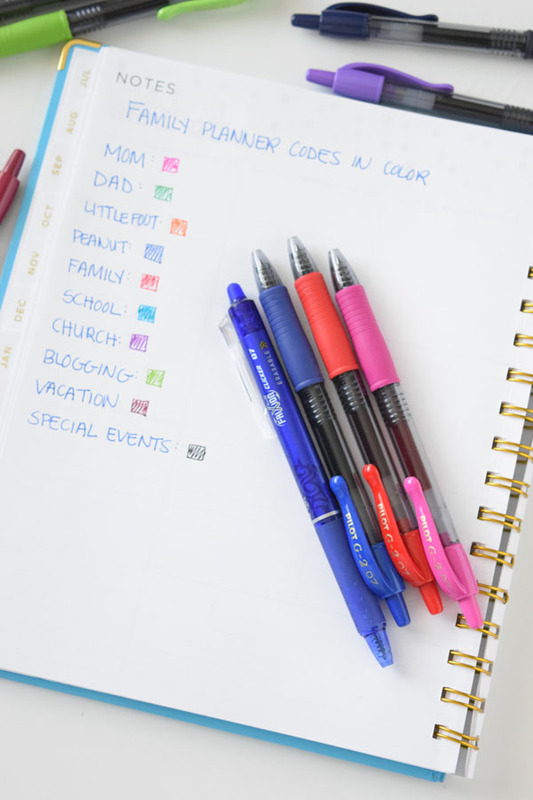 And having all those colors on hand has been just what I needed to get my planner organized for our family! I love being able to look at my planner in once glance and know where everyone needs to be for a particular day or week. I don’t have to scratch my head and wonder whose baseball practice is that day or what car needs to be taken to the shop. It’s all color coded perfectly. 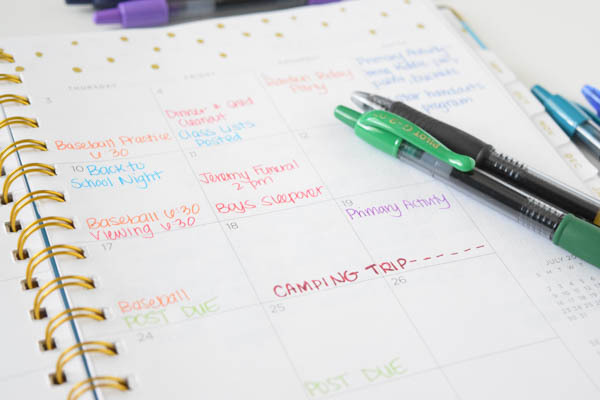 Find your planner of choice. 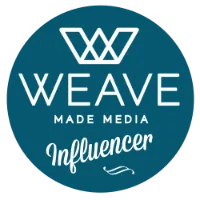 This could be a large calendar in your kitchen or family room, a small purse-sized planner, or a desk sized planner, whatever fits your style, your family, and your decor. Gather your Pilot G2 pens together. These pens are perfect because they have smooth writing gel and a comfortable grip. This step may require some discussion with your family. Set the pens out and decide what and who each color represents. I knew my kids would want a say in what color represented them so I had them each choose a color for themselves. Once you know where the colors are going, you need to write it down somewhere so you don’t forget! This will be your planner “key”. I used a Notes page at the back of planner so I can quickly reference it when planning. 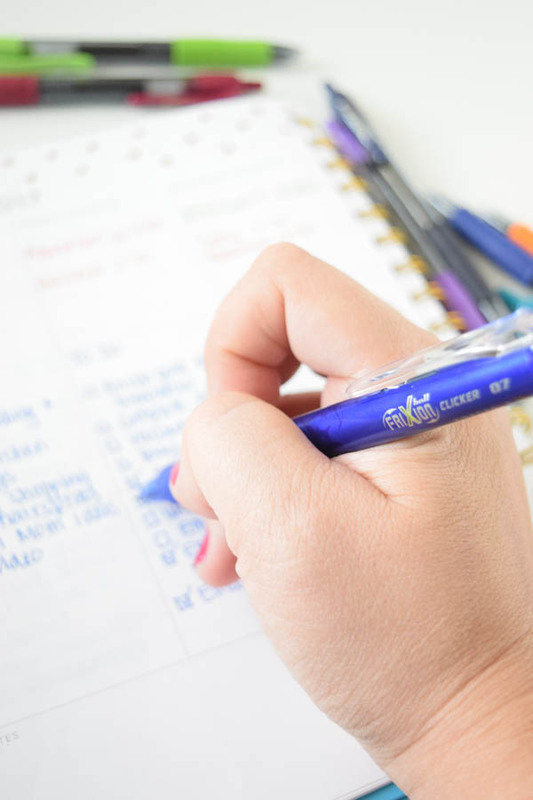 Be sure to set aside a pen for your daily “To Do” lists so you don’t get it confused with your schedule! 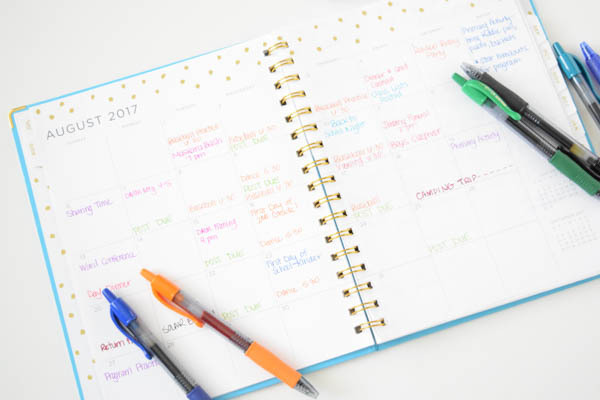 The thing I love about color coding our family schedule is the ability to use it for both our calendar and my daily schedule (my planner has both). The daily area can get pretty crowded sometimes and having different colors makes it much less busy and easy to read. 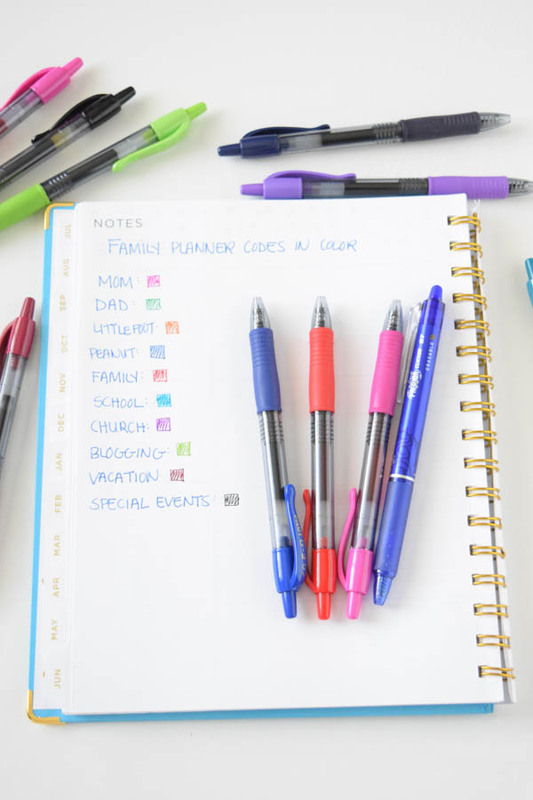 And the Pilot G2 Pens have been proven to write longer than any other pen so they are the perfect companion to keeping your planner organized to support your busy schedule! As part of the special 10 pack of Pilot G2 Pens I snagged at Walmart, they had a Bonus Frixion Pen that I use for my To-Do lists because it’s erasable! I like to keep my planner in my purse and needed to keep my pens organized too. I grabbed zippered pencil case to hold them so I never lose one! I really hate losing good pens, don’t you? 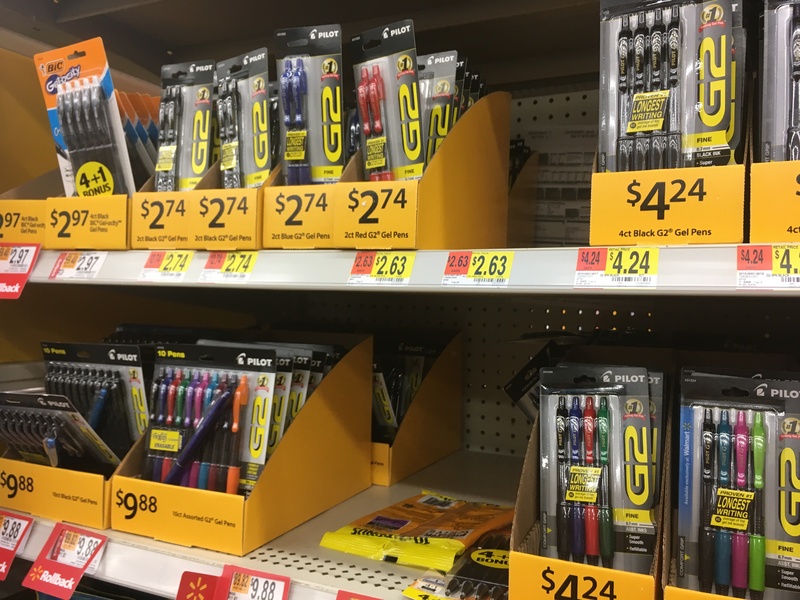 It was easy to find the pens in the Back To School section of Walmart. And you can save too on your own Pilot G2 Pens by using the coupon above!